Emily Yates is the Deputy Director for Envision Charlotte, where she is responsible for leading and implementing local programming to create a smarter, more sustainable Charlotte. Since the U.S. Federal government officially pulled out of the Paris Climate Accord, U.S. cities and subnational actors have stepped up to continue to reduce emissions and stay in line with the agreement targets. This was never more evident than earlier this month at COP 23 where discussions focused on “further, faster ambition together” and how cities are poised to lead in the efforts to address climate change. At Envision Charlotte, a local 501 (c)3 organization in Charlotte, North Carolina, we embody this desire and have successfully led the City’s progress as a globally recognized Smart City. Envision Charlotte (EC) is a public-private-plus collaborative that leverages innovation and technology to strengthen economic competitiveness, environmental sustainability and positive community impact. We work to foster this innovation and first-of-their kind programs and ensure that our programming can be measured, scaled and replicated to improve quality of life – not only within our cities, but in other cities, as well. With a strong team in place, Envision Charlotte secured the participation of 61 of the largest Uptown Charlotte commercial buildings. The buildings signed agreements to become part of Envision Charlotte’s energy program and reduce their energy consumption by 20% over five years. At the completion of the project this past December, we achieved a 19% reduction in energy consumption which equated to $26 million in billed energy savings or the reduction of CO2 emissions equivalent to removing 11,003 cars from the road. A key component to the success of this program is our Energy Roundtables. Envision Charlotte designed this program in partnership with UNCC’s Sustainable Integrated Building Systems (SIBS) program. When 61 buildings agreed to participate, shadow meters and kiosks were installed in the buildings to collect granular data and allow tenants to better understand how the building was consuming energy. UNCC engineering students collected and analyzed this data, and then presented building operators with recommendations and offered support for implementing those energy-reducing and cost-saving behavior changes. To date, 121 students have participated in the Energy Roundtables and the demand for this course continues to grow. While we focus mostly on the collection of quantitative data in this program, there are many qualitative examples of this program’s success as well. For example, in one of the buildings the students noticed a peak in energy consumption on a specific floor each morning at 10:00 AM. By examining the data and the building systems, students found that a prior CEO had set the thermostat in one conference room to an extremely low temperature for the daily staff meeting. By adjusting this single thermostat to within the recommended range, the building saved over $10,000 annually in energy savings, proving that small interventions can have substantial impact. The Envision Charlotte partners have proven that a cooperative approach to reducing energy use works. Because we saw so much success in this program, Envision Charlotte capitalized on this close working relationship between EC, Duke Energy, UNCC SIBS and the building operators or managers, and we secured a 3-year, $500,000 grant from the U.S. Department of Energy to expand the program to 200 buildings in the Charlotte area. In 2015 EC was identified by the Obama Administration as a national role model for the rapid deployment of smart city technologies and innovation. Rather than going to each city to share our model, we decided to invite cities to Charlotte to see it in action. We developed an annual conference called Envision America and each year we have welcomed city leaders from 10 U.S. cities. This 3-day conference and workshop was designed to create a peer network that can help diagnose and solve issues related to smart cities, sustainability and resilience. Over the past two years, Envision America has connected the know-how and resources of our nation’s private sector with the innovative spirit of urban communities to help create America’s new smarter future and bring positive economic, social and environmental benefits to Americans everywhere. 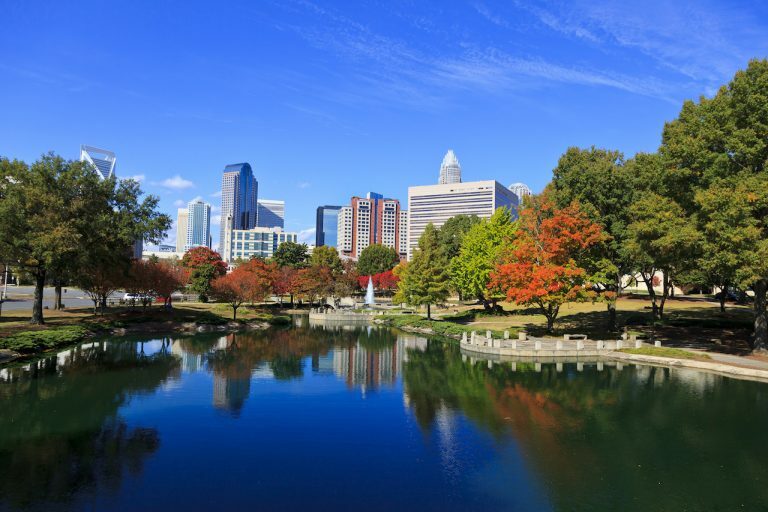 The By Cities For Cities conference will be hosted in Charlotte from June 5-7, 2018. The conference will follow the same style of convening as Envision America, but will expand to the topics of energy, water, waste, transportation, governance, and safety. There will be panel discussions as well as opportunities for focused dialogue between cities. We are issuing a global challenge to cities to become smarter by accelerating deployment of innovative technologies that tackle energy, water, waste, and transportation challenges. If you’re interested in learning more about this conference, please visit http://www.bycitiesforcities.com/ and enter your email to be notified when registration opens, and receive updates on the agenda.